James Herbert MacNair (1868-1955) is the least well known member of the so-called "Glasgow Four," a group of designers that also included the great Charles Rennie Mackintosh and Margaret and Frances Macdonald. MacNair was born in Glasgow, educated at the Collegiate School, Greenock, and, after studying watercolour painting in France, apprenticed himself to John Honeyman, a Glasgow architect, where he became friends with Mackintosh, a draughtsman with the firm. They attended Glasgow School of Art evenings, eventually meeting their future wives and co-workers -- the Macdonald sisters. MacNair completed his work at School of Art sometime in 1883 or 1884, and according to Roger Billcliffe, he opened "an office of his own at 227 West George Street, Glasgow (1895). From this address he worked as a designer, producing furniture, book-illustrations, book-plates, watercolours and posters, but never any architectural work. . . .Unlike Mackintosh, however, he does not appear to have received a major decorative commission, and were it not for the allowance from his father it is doubtful whether he could have made a living purely as a designer" (49). On several counts 1897 proved a fateful year. An office fire destroyed much of his work, an article on Glasgow designers in The Studio brought him some prominence, and his appointment as Instructor in Design at the School of Architecture and Applied Art at University College, Liverpool, led him to leave Glasgow. A popular teacher, MacNair carried out some interesting commissions for decorative schemes in the Liverpool area. He married Frances Macdonald in 1899, but the couple encountered hard times after he lost a small private income when a family shipping business went bankrupt. In an attempt to repair their fortunes, the couple returned to Glasgow, where MacNair met with a chilly reception from his wife's family. In desperate financial straights, MacNair tried a variety of jobs, including work as a postman and, later, manager of a garage, but after his wife died in 1921, he "vowed never to design or paint again," and two decades later he burned "a large trunk of drawings and watercolours by both Frances and himself" (66). He moved to an old people's home in 1943, dying in 1955. Billcliffe, Roger. "J. H. MacNair in Glasgow and Liverpool." Walker Art Gallery (Liverpool) Annual Report and Bulletin 1 (1970): 48-74. White, Gleeson. "Some Glasgow Designers and Their Work (Part II)." 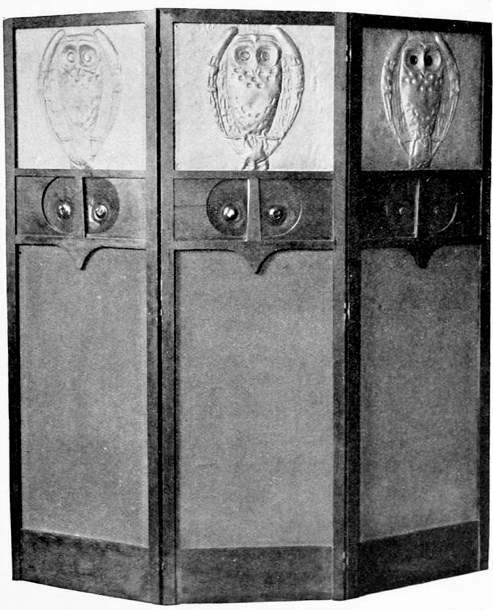 Studio 11 (1897).